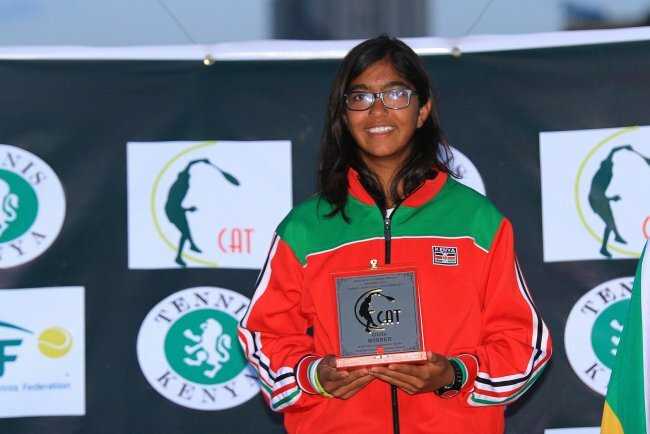 Kenya’s Sneha Kotecha is the African champion in the Under-14 Masters tennis competition after beating South Africa’s Delien Kleinhans 2-1 sets of 5-7, 6-3, 6-4 in a thrilling final played at Public Service Club on Sunday. Second seed Kotecha required close to three hours to win the final that saw her trail 2-4 the first set after unusually double faulting by her lofty standards. She however gained momentum in the second set with good service delivery and never looked back to shake off a nervy start. The third set saw Kleinhans battle hard as she matched Kotecha’s style of play in a 2-2 tie early on. Kotecha found her rhythm of crisp backhand shots to take the set and match in what was an exhilarating affair. This capped off an impressive performance for Kotecha who dispatched all comers en route to the final including top seeded Aisha Niyonkuru from Burundi with a 5-7, 6-2, 7-5 result. She also fought her way past highly rated South African Laura Van Der Merwel 6-4, 7-6 (7), 6-1. Kotecha’s win was a welcome respite for Kenya following a difficult campaign in the Africa Nations Cup that saw players eliminated particular at the hands of the dominant North Africans. In the boys’ final Elyes Marouani from Tunisia defeated Christopher Fok Kow from Mauritius 7-5, 3-6, 4-6. Khlowan Montsi from South Africa was placed third in the competition. Kenya’s sole representative Ryan Randiek crashed out in the group stage after a 7-6 (3), 4-6, 6-3 loss to Kow.